Two friends/ rivals both start-up Dragonball fighters z as they start engaging intensely into the game they end up fighting each other in real life and begin to act as the characters they are playing in the game and start charging their attacks of the characters and firing their attacks create a bright flash which ends the trailer with the title of the game. Two friends both start playing Dragonball fighters z. As they play some matches keeping drawing and getting engaged into the game very intensely win after loss, loss after win they both jump out of their seats beginning to fight one another after a few blocked punches and failed kick they both begin to take their selected characters personas and charge up their final attacks which creates an epic moment of them both intensely charging up and finally releasing their energy as super attack which will end the trailer. 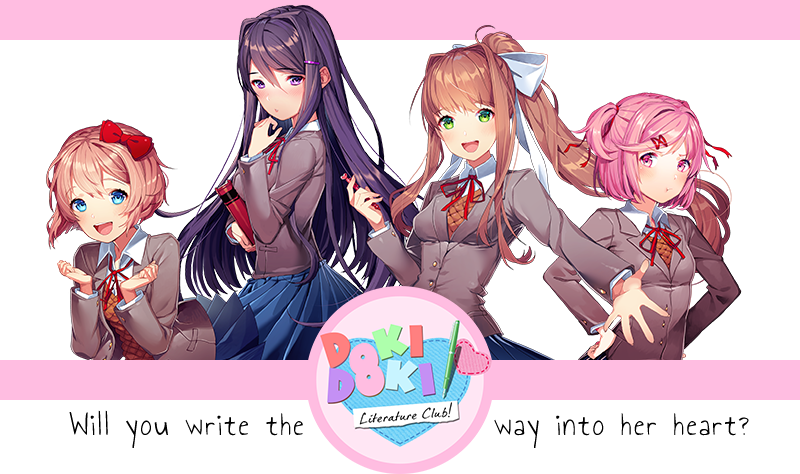 Boy goes to school and one of his friends recommends he join the literature club they attend and then the boy meets 3 new girls which he begins to attend regularly. the boy the starts to hit on one of the girls and from there, a series of events begin. Boy goes to school and one of his friends recommends he join the literature club they attend and then the boy meets 3 new girls which he begins to attend regularly. the boy the starts to hit on one of the girls due to them being paired into duos he starts regularly hitting on one of the girls and even ends up on going on a date with this individual. One day the club decides its time to plan for an upcoming school event the boy hits on the girl and confesses his love to her as he walks her home. On the day of the event, she isn’t at school and the boy and other club members get worried so the boy goes to her house to check on her and finds her hanged and dead in her room.